A brief but substantial overview of the history of south Lake County, California, where in 1853 Stone House was one of the first homes... probably the first house in Lake County more solid and enduring than a log cabin. 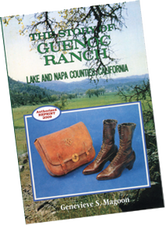 This little book looks at the only two Spanish land grants patented in Lake County, with a glimpse of the influx of pioneers and a good reason most of them settled closer to Clear Lake and outside the boundaries of the ranchos. transitions among the six owners of Stone House throughout its almost 160-year history. The 32-page booklet sells for $8 at Stone House during open house hours and is currently sold at Hardester's Market and Coyote Valley Pharmacy in Hidden Valley Lake and at the Middletown Bookstore, Bunk House Gift Shop, Twin Pine Casino gift shop, and Hardester's market in Middletown. It is sold at both the Lakeport Museum and the Schoolhouse Museum in Lower Lake, and at the Sharpsteen Museum in Calistoga. 32 pp. + color cover, 7x8½"
bought by the internationally famed beauty Lillie Langtry in 1888, and in the 1960s became the first large-scale winery in the rebirth of Lake County's wine industry.